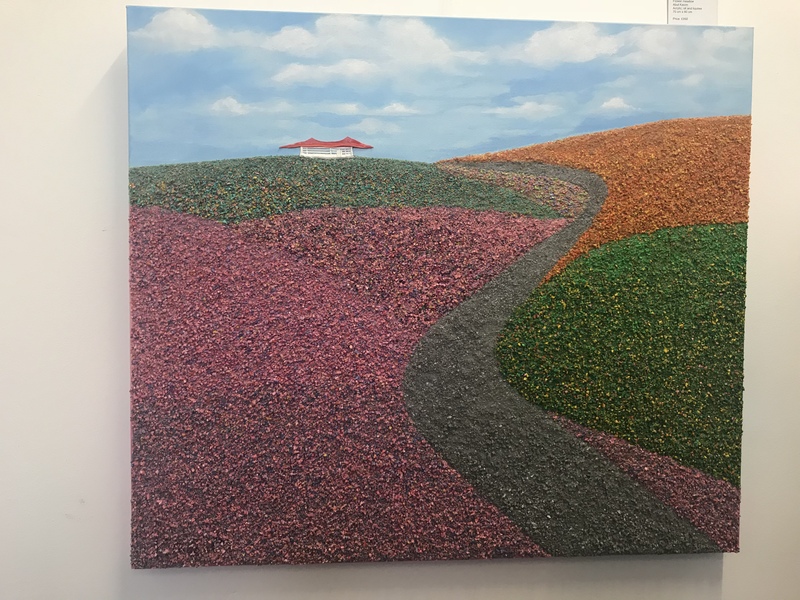 Dreams, meadows, happiness and peace; these are a few of the many things that inspire the artists whose works hang boldly on display at the JonaQuestArt Gallery in Greenwich. From now until the 28th of June, JonaQuestArt Gallery shall exhibit the works of Abul Kasim, Vanessa Birley, Cristina Cantilena and Caalista Painter, four artists using different mediums to create ‘Dreamscapes of the mind’; worlds where they feel safe and in which they have undergone the processes self discovery. At the opening night which was hosted on the 7th of June, Alt Africa had the opportunity to speak with one of the artists. Abul Kasim mentions space, mental health and Bangladesh as some of the influences in his collection. The artist who works with mixed media and acrylic spoke about “channeling an escape through art and using it as medium to practice mindfulness”. Speaking specifically on ‘Dreamscapes of the mind’ – the theme at the heart of the exhibition – his centerpiece of sorts ‘Flower Meadow’ is said to have been inspired by a dream he had of a place where he felt safe and at peace, consequently he brought that vision to life. The JonaQuestArt Gallery is a space for clientele of all kinds, with the overarching aim of making art accessible and erasing the arbitrary divide between African and European art by blending both worlds. They are also committed to supporting new artists and highlighting women in particular. Speaking with the curator of the exhibition and her motivations behind the theme she mentioned mental health, colour and ultimately an exploration of the inner worlds we all possess. Make sure to stop by the gallery and take in the colourful multi-textured display of Dreamscapes of the Mind. The exhibition runs until the 28th of June.